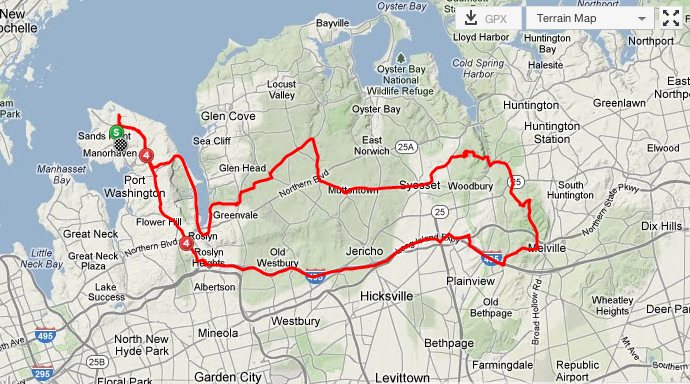 All the fun of our Stillwell ride plus a little more climbing. This is our standard “go to” ride. It’s about 45 miles, with 2100 ft. of climbing. The ride takes us out of Port Washington and out to the LIE Service road for a bit. The pace usually picks up a bit here as there are a couple of slow rolling climbs and a sprint to the Home Depot. We then hook a left on to Old Country Road and wind our way through the Sweet Hollow and Stillwell climbs. We then head back and the pace picks up as we make our way down Chicken Valley. We then finish it out with the soul crushing headwinds that are always by Bar Beach and the final 7-8% climb up W. Shore Road.